October 4, 2010 - The Department of Transportation Office of Inspector General recently issued their report on the Federal Aviation Administration's (FAA) Air Traffic Controller Optimum Training Solution Program (ATCOTS). 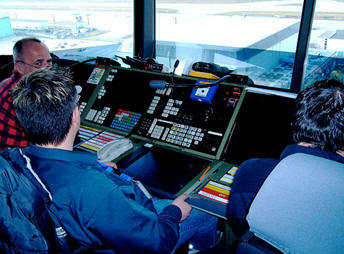 The ATCOTS program is a critical component of the FAA's plans to hire and train 15,000 new controllers by 2018. The Federal Aviation Administration (FAA) plans to hire and train nearly 15,000 new air traffic controllers through fiscal year (FY) 2018 to replace the large pool of air traffic controllers who were hired after the 1981 strike and are now retiring. In February 2008, the FAA began soliciting offers for the ATCOTS contract to replace two separate contracts supporting the controller training program. On September 9, 2008, the FAA awarded the contract to Raytheon. The performance based contract consists of a 5-year base period, worth $437 million, and two option periods (a 3-year period and a 2-year period), worth $422 million. The contract includes an award fee for Raytheon meeting acceptable levels of performance related to training outcomes and quality metrics and an incentive fee related to the cost of the services provided. The ATCOTS contract also allows Raytheon to suggest improvements to modernize the controller training program in areas such as hardware and software modifications, curriculum development and delivery, web-based training, and technology enhancements. In addition, the contract includes an option to institute a pilot program that allows these proposed changes to be tested and validated before being implemented on a larger scale. While Raytheon is involved with nearly every aspect of controller training, the FAA retains control for the overall training program as well as for recruiting and hiring controller candidates, conducting performance verification at the FAA Academy, and conducting on-the-job training. Accordingly, OIG audit objectives were to determine whether effective management and contract controls are in place to ensure program goals are achieved, and if the program has improved training methods currently provided to the controller workforce. In designing and executing the ATCOTS program, the FAA did not fully (1) mitigate staffing and cost issues identified during acquisition planning, (2) adequately define how many controllers would need training, or (3) initially implement adequate controls to oversee contractor services or ensure that fees paid for performance were justified. As a result, the FAA now faces significant challenges in achieving the program?s goals. To date, the ATCOTS contract costs and fees have far exceeded baseline estimates. Moreover, those funds have only been sufficient to support existing training methods and procedures; innovations to reduce training time and cost have not been implemented. OIG has come up with nine recommendations to improve oversight of the ATCOTS contract. FAA fully concurred with eight and proposed acceptable alternative actions for the remaining recommendation. FAA has also begun actions to address many of the issues identified during our audit. 1) Determine (a) if the existing contract mechanism can be effectively modified to achieve ATCOTS program goals within the current estimate of $859 million or (b) update cost estimates and requirements for its training needs and develop criteria for determining whether the Agency should exercise options in the contract. 2) Evaluate Raytheon?s staffing methodology to determine if facilities are receiving sufficient training and administrative support and develop an action plan for addressing those locations that need additional support. 3) Implement procedures to ensure that the Academy and facilities are properly entering training requirements into the Annual Work Plan. 4) Develop performance measures for award fees that directly link Raytheon?s performance to improvements in the controller training program and goals of the ATCOTS program. 5) Develop improved and reliable performance baselines and benchmarks in formulas for computing award fees to better compare and measure the contractor?s performance. 6) Implement internal procedures to require independent verifications of whether the contractor is achieving its performance measures. 7) Modify the contract to include incentive fees with predetermined cost targets based on accurately defined requirements; if this is not feasible, then include a performance measure(s) that provides an award fee for economical contract performance. 8) Ensure that the ATCOTS program office has enough qualified personnel to oversee the contractual, financial, and operational aspects of the program. 9) Develop a short- and medium-term ?roadmap? detailing potential changes to its controller training program and the impact those changes will have on the ATCOTS contract. The roadmap should include the impact that NextGen and other modernization programs will have on training new and existing controllers.